UTC Fire & Security’s nearly 40,000 employees operate in a variety of working environments around the globe. Some employees of the Farmington, CT-based security and safety products and solutions company work in high-risk and protocol-intensive environments, such as the company’s cash-in-transit and armed response operations. Others work alone or in groups at construction and mining locations, and more than 60 percent of employees perform field service and installation work, according to Ellen Quinn, the company’s vice president of environment, health and safety. Since parent company United Technologies Corp., based in Hartford, CT, first entered the fire and security segment in 2003, UTC Fire & Security has been up to the challenge of implementing its EHS management across an array of workplace cultures. This was confirmed by its receipt of the National Safety Council’s 2011 Robert W. Campbell Award – an international recognition of EHS excellence. The Campbell Award, which is underwritten by the ExxonMobil Foundation, honors organizations that successfully link EHS management with productivity and operational excellence. UTC Fire & Security accomplishes this by empowering every employee to promote an effective safety culture, Quinn said. Building on the company’s Safety First communications program, the SAFE (Scan, Assess, Fix, Execute) initiative is essential for engaging employees who work alone. It encourages employees to consider their own safety and conduct by practicing “personal state assessments,” as well as consider the safety of their surroundings. “When we review organizations that submit for the Campbell Award, we look for safety management systems that are well-integrated into the organization’s overall business,” said Wes Scott, consulting services manager for the National Safety Council and one of the onsite assessors of UTC Fire & Security. UTC Fire & Security demonstrated high EHS achievement linked to productivity and profitability, and “has a comprehensive commitment to safety excellence that reverberates throughout the organization,” he said. As a result of UTC Fire & Security’s EHS injury reduction programs, the company reported a total reduction of 96 percent in the lost-day incident rate and 85 percent in the total recordable incident rate between 2005 and 2010. Also impressive to the review panel was the company’s strong financial performance. UTC Fire & Security reported that sales increased to $6.5 billion in 2010 from $2.5 billion in 2003, while return-on-sales figures increased to 12 percent from 4.5 percent during the same time period. Strong EHS performance can be a “differentiator,” Quinn said. She referenced the success of the Australia branch of the company’s fire safety installation business, Chubb Fire & Security, which won the Australian Department of Commerce WorkSafe Platinum Award in 2006 and 2009. This demonstrates to potential customers that the company takes safety seriously, Quinn said. According to John Dony, project manager for the Campbell Institute at the National Safety Council, one notable aspect of UTC Fire & Security’s EHS management is how well it has been integrated throughout a company that is so new and has a global reach. When UTC acquired Chubb in 2005, it formed UTC Fire & Security. From that point until 2010, the company acquired more than 60 businesses across 35 countries. National Safety Council President and CEO Janet Froetscher was similarly impressed. “Despite challenges presented by numerous acquisitions and mergers, UTC Fire & Security has grown and sustained an outstanding safety culture with a deep, heartfelt commitment to the Campbell ideals,” she said. Quinn said making EHS management the first topic of discussion with new acquisitions is instrumental to effective integration. EHS management also is discussed in the context of how it supports and integrates into existing business functions, she said. Quinn said that presenting safety and health as a business partner has proven effective when introducing the company’s EHS management to new acquisitions. Her team uses strategies such as asking new acquisitions what safety programs already are in place and what concerns managers have about their workplace’s safety, and appealing to employers’ desire to protect the safety and health of their employees. Fostering competition among companies has made UTC Fire & Security’s safety metrics shine, Quinn said. The company makes efforts to ensure every business unit knows where it stands in regard to EHS management in comparison to the others, and each unit is encouraged to be the best by putting safety first. Managers are expected to remain in constant communication with their business units on safety metrics – both the good and the bad. The company also recognizes that safety and health has to be highlighted not only from the top down, but from the bottom up, and uses its EHS “IDEA” program to promote safety. The program encourages employees to “IDentify, Eliminate and Adhere” by coming up with creative solutions to safety hazards in their work environments. To motivate employees to participate in the program, the company’s president mentions significant employee contributions during quarterly calls, and awards are presented locally for particularly creative solutions. 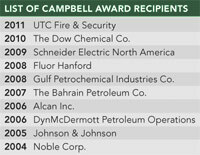 As the latest Campbell Award winner, UTC Fire & Security becomes the newest member of the Campbell Institute. The institute provides informational resources to industry and classrooms and promotes the value of linking safety and health with business. “MBA students of today will be learning about integration and acquisitions. There is a lot of knowledge about safety that aspiring and current business leaders can learn from UTC Fire & Security,” Dony said. Quinn said she looks forward to her company’s involvement with the institute, identifying the potential for benchmarking and “guidelines for excellence” as integral to increasing awareness and support of strong EHS management. Companies can learn from UTC Fire & Security’s example that when looking to change safety risks, employers should attempt to make “step-function” changes, or complete changes, not only incremental ones, Quinn said. “Step-function changes will make you think about things differently,” she said. 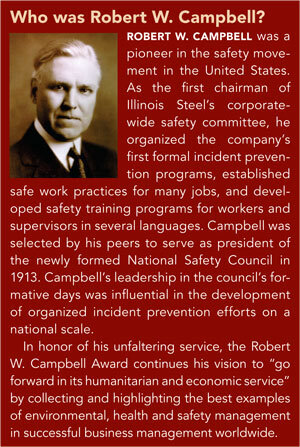 Applications are being accepted for the 2012 Robert W. Campbell award and are due May 31, 2012. Visit www.campbellaward.org for more information and to take a five-minute self-assessment to determine your organization’s readiness to apply.